Well today in the Northeast we had a blizzard. I was awoken by Hazel yelling when the power went off this morning. It came back on about an hour later and was on for about 40 minutes. Then it was off again for a few hours. What are to snowbound girls to do? Well after putting on some layers to stay warm without heat, we did our nails. 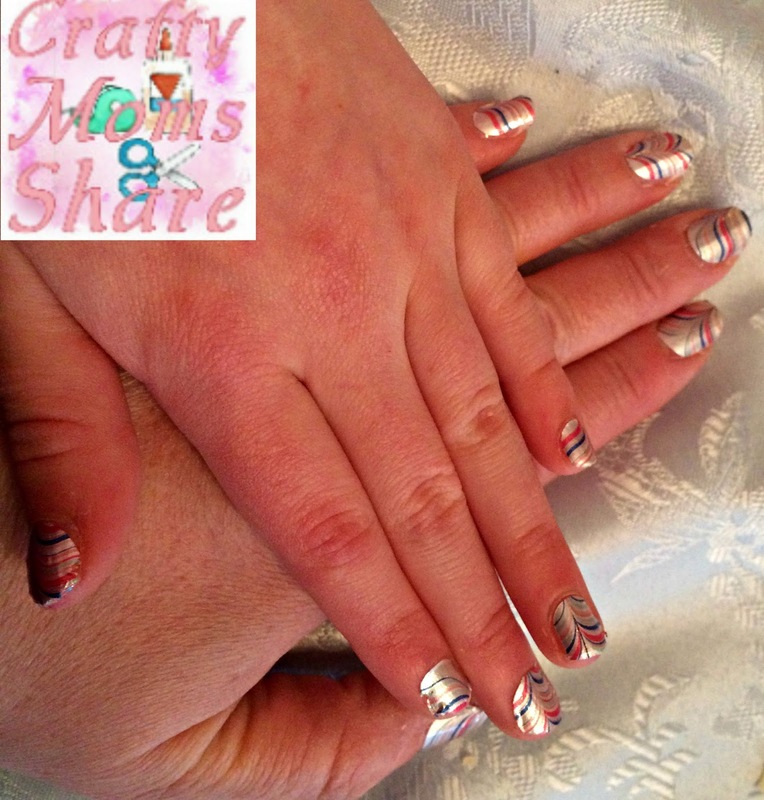 Have you heard of Color Street nail wraps yet? We LOVE them!! I have four friends who sell them now. One of them gave me a set of Sunset Canyon and asked me to do a Mommy and Me picture with them. So we did our nails. These wraps are so easy Hazel can do them herself!! And there is no dry time. It literally takes about ten minutes to give yourself a manicure with them and then they are good to go and last longer than regular nail polish. Oh and they are regular nail polish. What do you think? Hazel's hand is on top of mine. I am happy with how they came out though I don't think I would pick this one for myself all the time. I don't like the silver background color on my nails that much, but that is my nail color thing. If you like them or like having manicured nails but want a cheaper way of doing it be sure to check out Color Street. 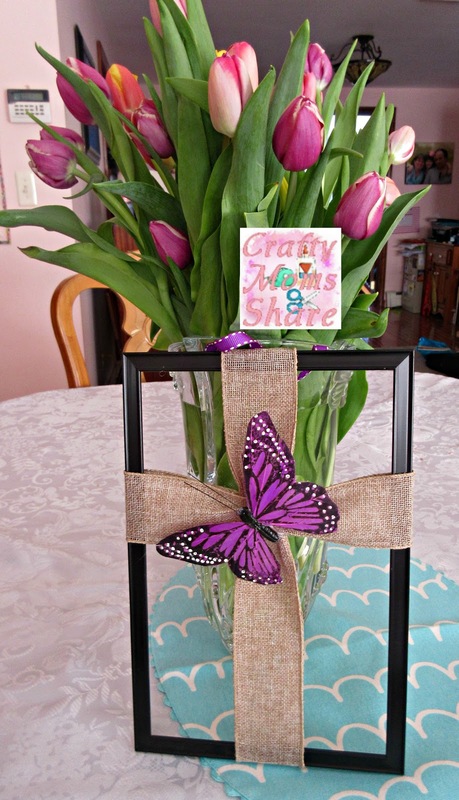 They are perfect for Easter baskets as well. Luckily our power came back on and we were able to do things like make beef stew for dinner and watch television and most importantly stay warm. We watched the snow fall and it is still falling. Tomorrow is another snow day for Hazel. My parents were not as lucky. Their power will probably be out for a few days again. Luckily they have a generator so they have heat. 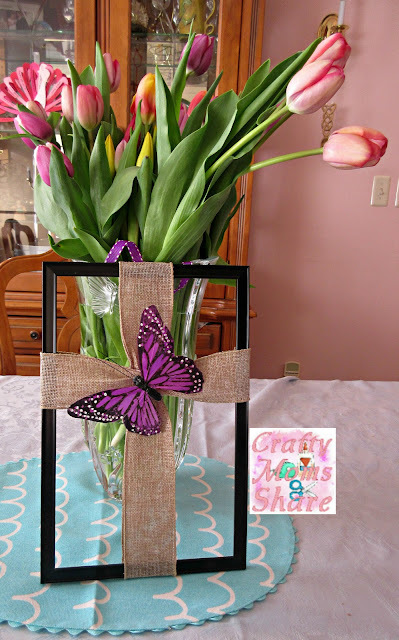 While checking out Easter things at Oriental Trading I saw the Cross-Wrapped Sign with Flower and thought I could make something like that. I headed over to Dollar Tree for supplies. 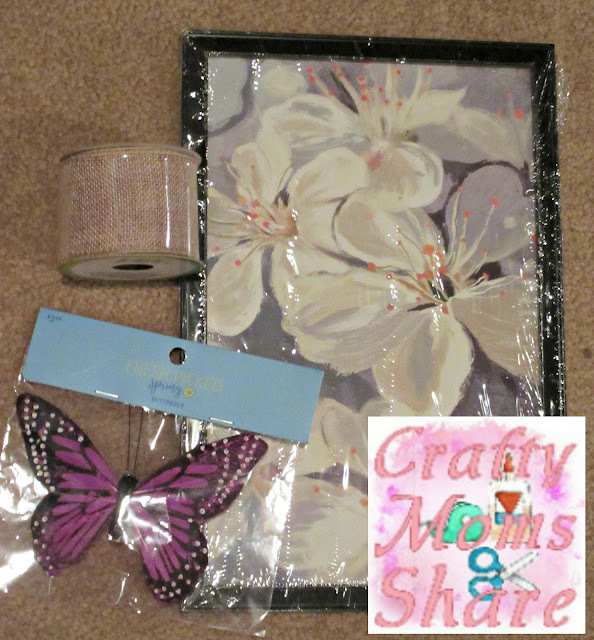 I bought a framed piece of artwork and a spool of burlap ribbon. Hazel picked out a butterfly at Joann's, but Dollar Tree has them as well (ours didn't have any in stock at the time). You could also use a flower like the one at Oriental Trading. To make this craft, I removed the print, glass and back of the frame. I decided to keep it black. I did consider painting it but didn't know how the plastic would look. I wrapped the burlap ribbon around the length of the frame. I did it all the way around and hot glued it to the top and bottom on the back of the frame. I did the same thing going across the width of the frame. Then I took a scrap piece of thin ribbon (because it was near by but thread, yarn, string, etc. would work) and wrapped tightly in each direction where the ribbons cross. Then I hot glued the butterfly on. I LOVE how it came out! 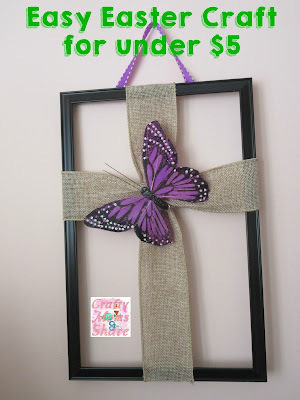 I also hot glued a ribbon to be able to hang it up on the back. I am glad we picked the purple butterfly. I love how it pops and I love how a butterfly symbolizes the new life!! I literally spent $3.50 on this project plus tax. Enjoy!! Be sure to check out Easter Crafts, Supplies, and More At Dollar Tree!